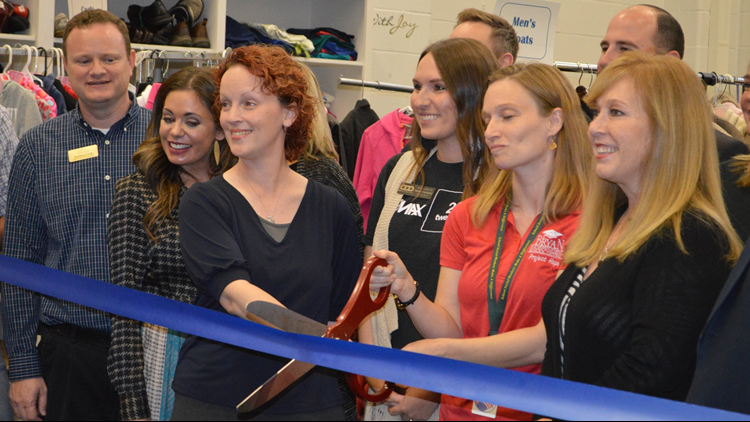 Bryan ISD celebrated the grand opening of Hope's Locker, a free store where the district's students and their families can shop for new and gently used clothing, shoes, school supplies, toiletries and non-perishable food. Bryan ISD celebrated the grand opening of Hope’s Locker, a free store where the district’s students and their families can shop for new and gently used clothing, shoes, school supplies, toiletries and non-perishable food. Bryan ISD’s Project HOPE teamed up with the Bryan-College Station Regional Association of Realtors to create Hope’s Locker. Managed by Bryan ISD and supported by volunteers, Hope’s Locker is located on the east side of Bryan Collegiate High School. The store is open every Tuesday from 4:15 p.m. to 6 p.m. but will be closed the falling two Tuesday’s due to remodeling. Hope’s Locker will reopen Tuesday, Nov. 27. Hope’s Locker is currently seeking donations of new underwear, socks, toiletries and non-perishable food for its food pantry. For more information about Hope’s Locker or to donate items, contact Dupper at (979) 209-7042.